The 2012 Victory Cross Country Tour sets a new high standard for hard baggers by providing riders with unprecedented comfort and the greatest cargo capacity of any production motorcycle in the world. Some of the new bits and baubles for the Cross Country Tour include the Victory Comfort Control System, which features upper and lower air controls to fine tune airflow reaching the seating area. 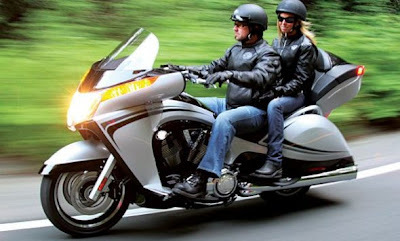 Modern features like a power windshield, cruise control, a full infotainment system, and split heated seats and handgrips set this bike miles ahead of any other touring motorcycle.